The earliest known documentary reference to Beenham was in A.D. 956, during the Saxon period, when it was referred to as Benna's Hamme, which translates to Benna’s meadow or enclosure. It is, however, a matter for conjecture whether there was a Saxon settlement here at an earlier date and whether the men of Beenham were drafted into the “Fyrd”, which King Alfred led when he beat the Danes in the neighbouring settlement of Englefield in A..D. 871. We do know, however, that people were living and hunting in and around Beenham from Neolithic times, as the Berkshire Field Research Group reported in their magazine (Bulletin Dec 1993) the discovery of a Neolithic greenstone axe at Beenham, which led to the further discovery of a ring ditch on land between the junctions with Beenham Hill, Grange Lane and the Bath Road. During the excavation of the so-called Aldermaston Wharf site the remains of a Roman bathhouse was discovered. West Berkshire Heritage Service is confident that it was part of an important Roman Villa site and that the rest had been destroyed at an earlier date during the process of gravel extraction. They also found evidence of multiple-period use of the site, including Bronze Age finds. At the time of the Norman Conquest, Beenham, with Reading, was part of the King's domain, which was probably the reason that there is no reference to Beenham in the Domesday Survey (1086). There is, however, record of the manor and advowson of the rectory of Beenham being granted by Henry I to the Abbot and Monks of Reading Abbey on its foundation in 1121. In 1276 the abbot had free warren in Beenham, in the manor of Reading and in 1291, during the reign of Edward I, Beenham was described as a hamlet attached to Reading, contributing to taxes towards the cost of the crusades. There has been much confusion associated with Beenham over the years with the villages of Benham Valence, Benham Lovel, Hoe Benham and Marsh Benham in the western part of the county. Similarly there has been confusion over the Manor of Beenham. It would appear that there were two manors. One in the ownership of Reading Abbey centred around what was known as Beenham Farm now The Grange, situated in the valley floor on land, which now, in part, contains Beenham Industrial Estate. Following the dissolution of the monasteries, Henry VIII granted the manor of Beenham, comprising 37 acres to Sir Henry Norreys. It is documented that in the late 16th Century, the second manor, now known as Beenham House, had been under leased, by the Perkins family of Ufton from Reade Stafford, Lord of the Manor of Bradfield, who held it directly from the Crown. There is no mention in this document of any connection with the Abbey at Reading; we can in all probability, therefore, conclude that this part of the parish had always lain outside the possessions of the Abbey. Both manors have had a number of different owners and been let to tenants and in consequence their histories have become somewhat confused. During the first Civil War 1642-1646 much of Berkshire was a no mans land between the Parliamentary troops in Reading and the Royalists in Oxford until the King established outposts in Donnington and Basing. Marauding troopers abounded sacking Aldermaston House and a barmaid at the Black Horse Beenham was murdered. There was an attack on Hall Place Farm by nine troopers, who were half starved and probably desperate. Mrs Hildesley managed to send a message to her husband who rushed home accompanied by a number of neighbours, who managed to drive off the soldiers all of whom were injured and unable to return to their quarters. Richard Webb of Beenham sought recompense for their services to the Parliamentarians but didn’t appear to receive the remuneration he was expecting. On 25th October 1644 prior to the second Battle of Newbury, the Parliamentarian Army camped on Beenham Heath, making plans for the ensuing battle. The village developed in two parts, which only joined together in the 20th century. One group of houses clustered round The Stocks Public House; the other, possibly older part dating from the 17th century around the Six Bells Public House. The pub took its name from the bells of St Mary’s, Parish Church, which was situated between the two parts of the village. The village forge used to be near the Six Bells but now only the cottages connected with it remain. A Methodist Chapel was built in Clay Lane behind Holly Cottage but was superseded by a new Chapel opposite the village green in 1862 at a cost of £150. It is now an interesting family home. The census of 1801 shows that there were 70 inhabited and two uninhabited houses in Beenham. There were 381 inhabitants, incorporated into 73 families and no less than 14 families were 'paupers' supported mainly from the Poor Rate. The population peaked in 1871 with 556 inhabitants but had dropped again by 1901 to 508. The Parish Church of St. Mary's is on the site of two previous ones. The first of Saxon origin was destroyed by fire in 1794 after being struck by lightning. The second church was also destroyed by fire except for the brick tower and replaced by the modern day church in 1859. The most notable incumbent was Thomas Stackhouse M.A., (1733-1752) ordained London in 1704, a prolific writer, author of "New History of the Bible from the Beginning of the World to the Establishment of Christianity", an important theological work at the time. He was rescued from extreme poverty by the appointment at Beenham, through the good offices of the Bishop of London, Edward Gibson, in 1733. He lived in the lovely Rectory, now St. Mary's Farmhouse. 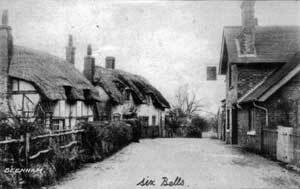 The Bushnell family provided four vicars to the parish of Beenham in the 19th and early 20th Century. The current patron of St. Mary's is Keble College, Oxford. Other notable buildings are Beenham House, overlooking the Kennet Valley; White Cottage the oldest house in the parish, a late Medieval Hall House with its cruck barn; Awberry Farm and Oakwood Farm; Butlers Farm, of 16th and 17th century origins, has the further attraction of being the headquarters of the Wolf Conservation Trust, where wolves from various parts of the world can be seen. Before its closure in 1999, The Stocks Public House had served in its time as a shop, a bakery and an alehouse. 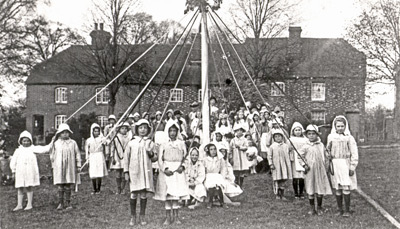 Community activities and special celebrations continue today on the Village Green, in the Community Room in the village school and in the “new” Working Men’s Club and in the Victory Hall, which was built by subscription, in memory of those who had lost their lives in the First World War. The Victory Hall continues today as a centre for adult education classes, private functions, village meetings and societies. N.B. Archaeological information has been provided by West Berkshire Heritage Service, Newbury Museum, The Wharf, Newbury, Berks. 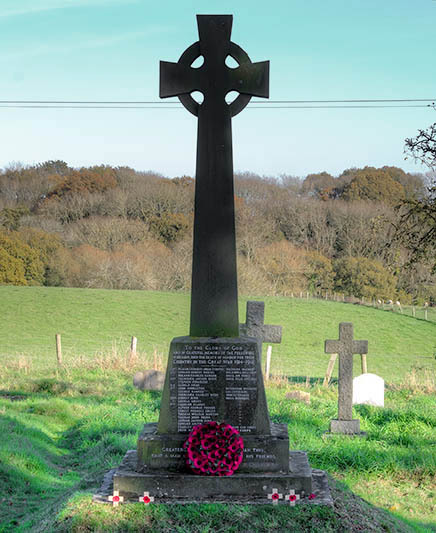 Communities throughout the country have commemorated the centenary of the First World War in different ways. 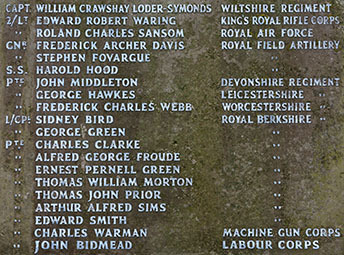 In Beenham, the war memorial in the church cemetery lists the names of twenty men with local connections who made the ultimate sacrifice. Local amateur historians have recognised the contributions that these men, and others, made to the “war to end all wars”. To commemorate the 100th anniversary of the men's death, Chris Curry will publish short biographies of thirty men with village connections. These will be issued on the centenary of the month they died, over the four years of the war. The publications will be included in the church magazine and on this web site. As each biography is published, the name below will appear as a hyperlink: underlined and in blue. When clicked, each will open as a separate document in it's own window, and can be saved or printed should you wish. As part of a national project, the bell ringers of St Mary's church will recognise the 100th anniversaries with dedicated ringing in the month of these men's deaths.